I recently received an email from Michelle of Pro For Sho asking if I would be interested in reviewing their ear protection. I expressed my interest because of the mention of rifle shooting and their website was up front about their product being useful for shooting. I frequently put in plugs rather than try to work around the bulky external muffs required to get good protection. 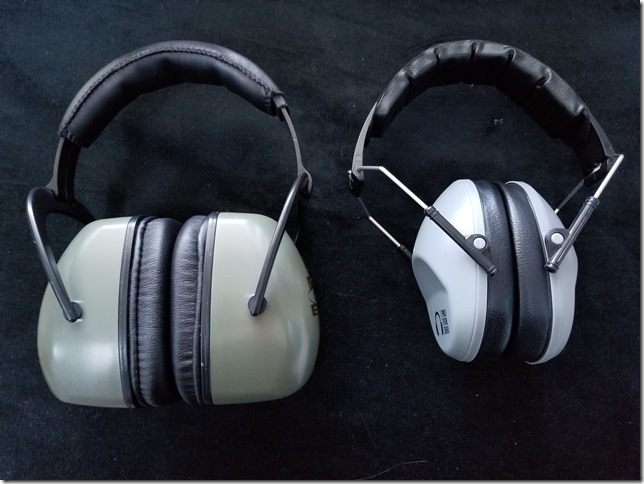 And besides, they are claiming 34db NRR when my go-to muffs for pistol shooting when I am alone (Pro Ears) are at best 30db (title says 30db, but the text of the description says 26db) NRR. I received them today and tried them on. As I expected, they cannot compare to Pro Ears in the softness of the material around the ears (they are amazing!). But they are better than a lot of muffs I have used and I expect they will be comfortable with the one or two hour sessions I have when using passive muffs. I put on some loud music with plenty of high frequency content and compare the two sets of muffs. I couldn’t determine which were better. This is a huge difference in clearance between your head and the rifle stock. I got out my rifle in Bellevue (I have another rifle in Idaho I should try it with as well) with the least clearance. As expected the Pro Ears were being pushed up by the stock. The Pro For Sho muffs just barely touched. It’s a win! I just want to mention, since we keep getting a lot of similar feedback from our customers, I think it’s necessary to point out that due to the High NRR Ratio, if you find the earmuffs a bit snug when you first start using them, it’s totally normal. It will loosen up over time. Please FIRST double check to make sure you fully adjust the length of the earmuffs by sliding the cup up and down to find a better fit. Just in case the earmuffs are still tight, we always suggest to stretch them to make it more comfortable. If the earmuffs are still tight after you fully adjust it, take the earmuffs out and clamp it over the box and let it sit overnight. It worked great with most of our customers who tried it. This comes in one size only, which is Standard Size. This is a more compact sized earmuffs, which is available in 10 different colors. This comes in Large Size and has an NRR of 32dB. This was also designed with larger ear cups. This one is specifically built for larger head size, available only in black color. I would like to point out that the Small size actually is the Standard size which is designed for a universal fit, and the Large size should be Extra Large size. Since Amazon only offers a very limited option of the Size Variation, we had to use Small and Large instead of Standard and Extra Large. We already tried coordinating with Amazon to address this issue. A little over a week ago AmmoMan.com contacted me about placing an ad to get the word out about their new “two day shipping”. 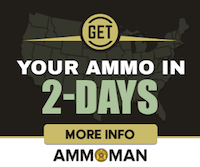 97% of people are expected to get their ammo within two days but some may take three days. They gave me a code to order some ammo with and I made two different orders. I had one shipped to Idaho and the other shipped to my Bellevue Washington address. From looking at their map it appeared to me that the Idaho shipment could take three days. It turned out that, according to FedEx, the Idaho shipment arrived 50 minutes before the Bellevue order and both were on day two after the order. Nice! The other shipment was the original 500 round case, with shipping labels attached, which Federal Ammo packages their American Eagle .223 Ammo in. 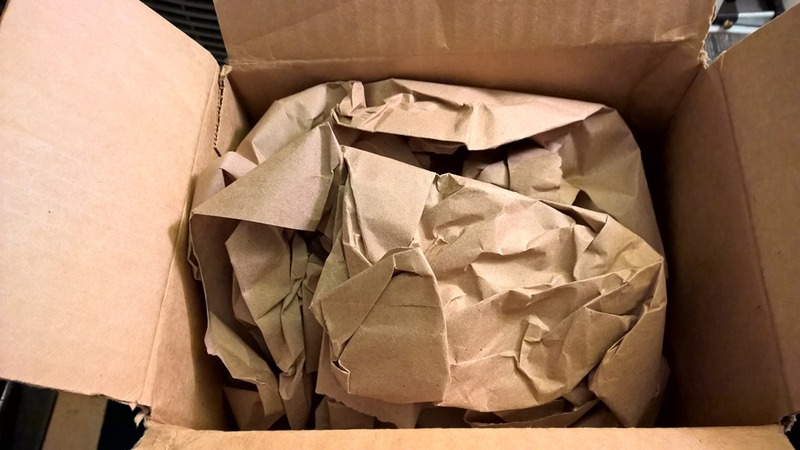 There were no issues with either packaging. I do a lot of indoor shooting and the possibility of lead poisoning is something that concerns me. I get a blood test for lead every year and it stays within the “normal” range but when I wasn’t doing much shooting for a couple years it went to almost undetectable levels. Hence, I know I have a lead source in my environment and it’s probably either the indoor range and/or the reloading. 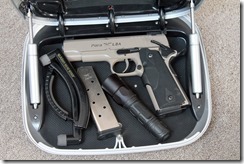 When I saw Powder Valley had no lead, small pistol, primers available I ordered some to test. I didn’t know they were even available to the reloading community. 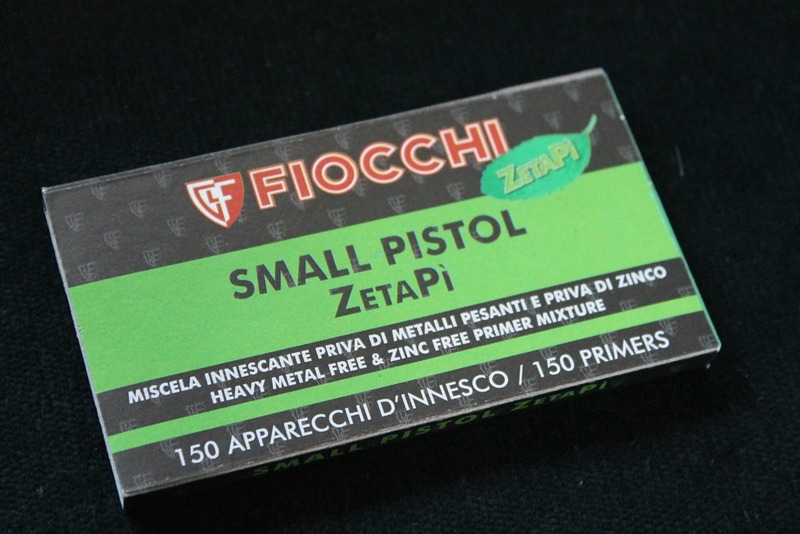 These primers would probably reduce the lead exposure at both the range and when handling the reused brass during reloading. 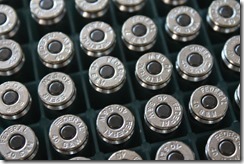 They are a bit more expensive than the Winchester primers (WSP) I normally use. 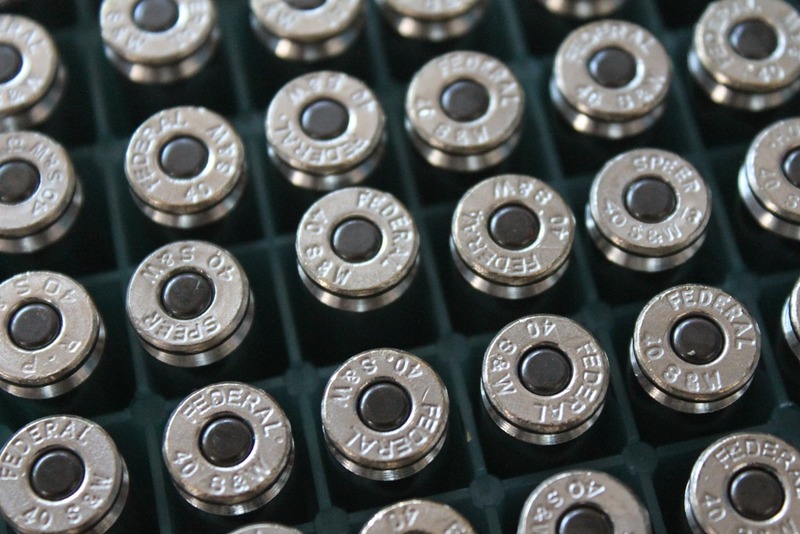 Before shipping the Winchester WSP primers are $28/1000 (2.8 cents each). 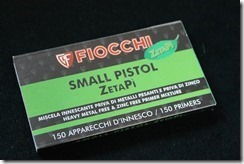 The Fiocchi no lead primers are $57/1500 (3.8 cents each). A penny per round difference… hmm. Okay, I would pay that if it significantly reduced the lead I’m getting into my system. Hmmm.. The standard deviation and especially the extreme spread are worse with the no lead primers. And the Fiocchi standard primers are terrible! The velocity is lower and the standard deviation and extreme spread is through the roof. I loaded up some more rounds and tested them and got essentially the same results. 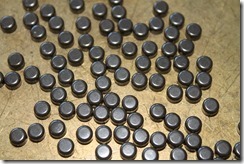 With the polymer coated bullets I use outdoors and CFE Pistol powder the results were even worse. The standard deviation went from about 10 fps with WSP to about 18 fps with the Fiocchi no lead primers (I haven’t tested the Fiocchi standard primers with these bullets). I really don’t want to keep two types of primers around. I want to minimize the number of components types rather than expand them. And if I increase the standard deviation on the match ammo I would need to increase the mean velocity to insure I continue reliably making major PF. Increasing the velocity also means increasing the reloading cost above that of the increased primer cost, and increasing the recoil to solve a “problem” I don’t really have. I think I’m going to continue using the WSP primers. ** Yes, I know these aren’t reliably making Major Power Factor, I’m increasing the powder charge some based upon this data. This load is just for practice anyway. I have never used them at a match. For USPSA matches I have been using Black Bullets, WSP primers, and ETR7 which has been repeatedly tested to give me a PF of a little over 170 with a SDev of about 9 fps. We have been informed by the Head Office of Interflon in the Netherlands that there is an issue with selling Interflon products directly to consumers online, because the Licensing Agreement that Interflon has with DuPont for the use of Teflon in their products limits them to selling these products to the professional market only. Selling to consumers is in breach of this licensing agreement and we have been asked to take the offering on Amazon offline immediately. We will be taking the product off line by the end of this week and will no longer be selling directly to consumers. The product will still be available to professional buyers such as gun clubs and gun stores. I haven’t seen this in any gun store so I immediately went on line at Amazon and ordered what I figured would be a lifetime supply for me. I don’t know if they will actually ship it but I figured it wouldn’t hurt to try. Update: This product is being taking off the direct to customer market. See this post for more information. I am writing to you because I represent a lubricant called Fin Super. Fin Super is a multi-purpose spray. It is not very well known in the states, but has been used for a number of years by military and police brigades for firearm lubrication in Europe. Do you accept product to conduct reviews on your blog? If so, I would be happy to send you a sample to try. The feedback I get is always overwhelmingly positive. A copy of the article is included in text form lower in the email. Article published in the February 2006 edition of TACARMI, the first European gun culture magazine. A review written by a friend. 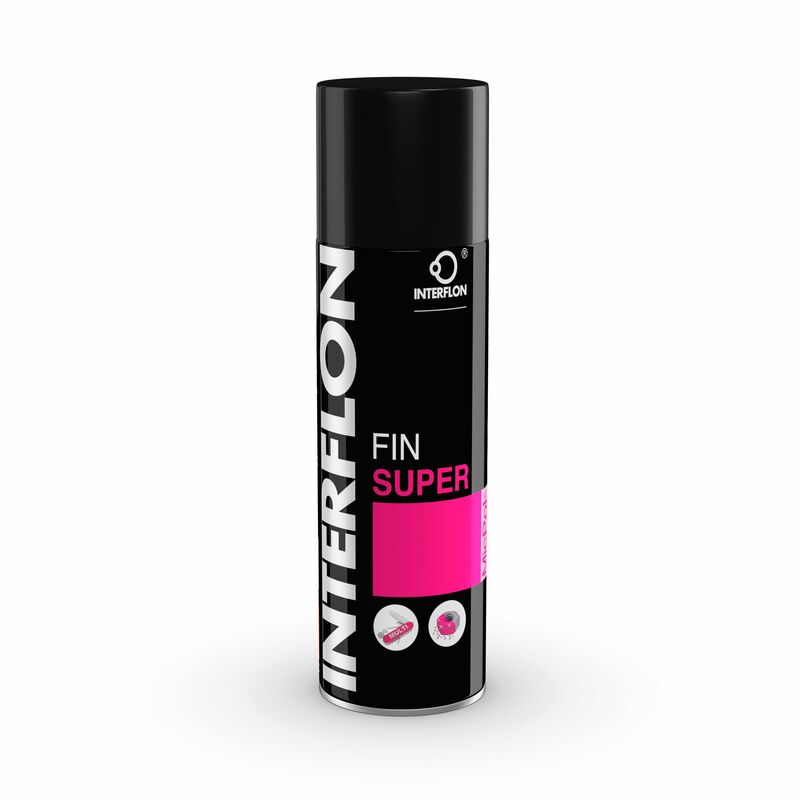 You can purchase Interflon Fin Super from Amazon. Another problem with liquid lubricants, particularly with my .22s, it seemed that they contributed to the build up of powder residue in the receivers. Dry lubricants should reduce that problem. And finally I have shot in matches where it was very cold, sub-zero, and because I had been using appropriate lubricants I had higher scores than Master class shooters because their guns turned into single shots instead of semi-auto because the slide would not go into battery without manual assistance. Dry lubricants don’t have this problem. I had used a Teflon spray lubricant before that dried within seconds but the lubricant seemed to rub off very easily. I didn’t trust it to actually reduce wear over extended shooting sessions. Would this lubricant persist after extensive use? Would it make cleaning the inside of the barrel easier like the current lubricant (the original Friction Defense, not Friction Defense Xtreme) I was using? One essential – and actually, in terms of the way it appears, almost unique – characteristic of Fin Super is that it is a semi-dry detergent-lubricant-protective product (the manufacturer considers it to be “dry”, but we think our definition is more accurate). After it has been applied to metal after giving the bottle a short but necessary shake, it evaporates slowly leaving a highly adhesive film offering the great advantage that it does not grease or stain the hands and clothes, nor does it attract dust or dirt. 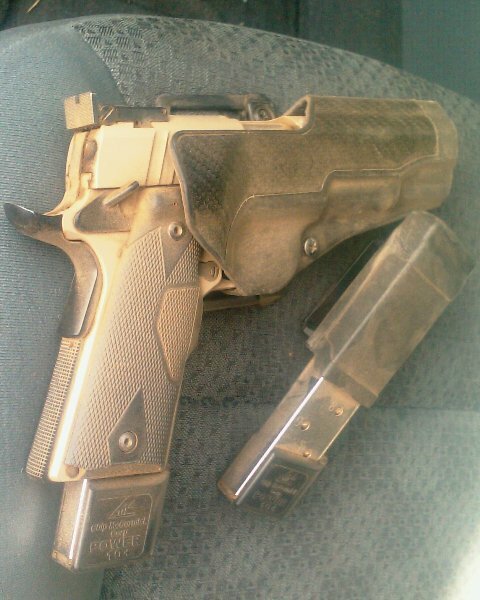 I had closed the action of the gun and put it in my holster with a loaded magazine and a round in the chamber. Of course evaporation is going to be unlikely in that environment. I tested it again by leaving the gun unassembled and having an incandescent light bulb shine on it from a few inches away overnight. The surfaces were no longer wet but had a film that wasn’t really wet and adhered well. After shooting hundreds of rounds through the gun the barrel cleaned up easily. Perhaps easier than it would have with Friction Defense. The film was still detectable with a rub of your finger over the surfaces and hence the lubricant had passed my two tests. But the slow drying brought up another question. 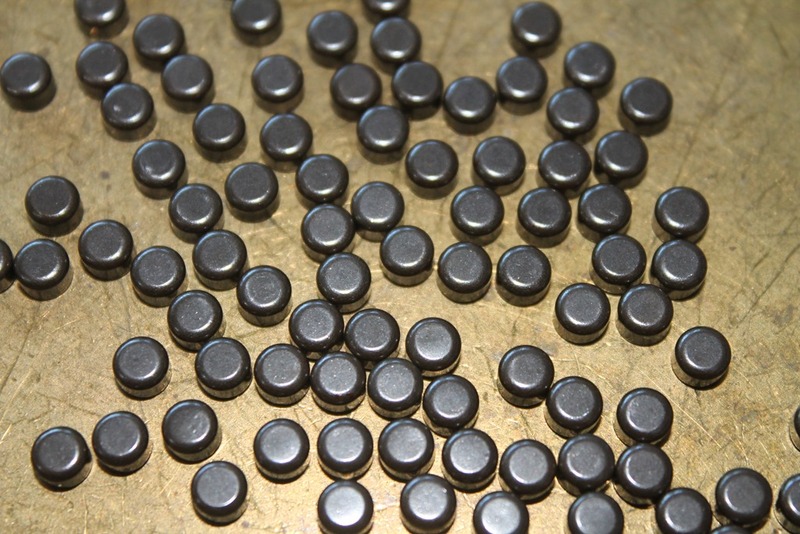 Let’s take a look at the stated chemical and physical properties: this is a semi-synthetic PTFE (Teflon) oil with a medium density (0.85 grams per millilitre at 20°C), flash point at 80° C and self-ignition at 370° C, a muddy yellow-nut brown colour common to many products to which Teflon has been added, almost insoluble in water, usable between -43° C and +170° C (although it should be pointed out that after application and vaporation of solvents the product remains effective at between -200 and +300° C). Okay. -43 C (-45.4F) is probably below the temperature I will be using it. But what does “usable” mean? Will the gun still cycle at low temperatures? I applied the lubricant to all the usual surfaces of the gun and without wiping the excess off put the gun in the freezer (6.2F) for several hours. When I pulled it out it was almost instantly covered in frost. I should have taken a picture because it was a pretty funny looking gun with the frost growing on all the metal surfaces. But despite the cold and frost the slide and hammer moved as freely as they do at normal temperatures. Interflon Fin Super has passed all my tests and I’m now using it on all my guns (when I get around to cleaning them). The price does seem to be a bit high ($28.00 + $7.49 shipping from Amazon). But at the current rate of consumption I’m sure the can will supply enough lubrication such that each gun cleaning will only amount to a few pennies. I can live with that for the benefits of having a semi-dry lubricant. 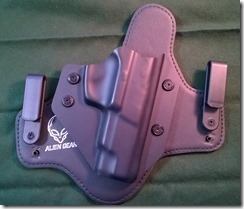 I received a IWB holster from Alien Gear for review. I have the Ruger P89 Cloak Tuck 2.0 but they have different versions of holsters for a very wide selection of guns. I count 441 different pistols and 14 different revolvers. First put on your pants and sturdy belt. Leave your pants unbuttoned and unzipped. 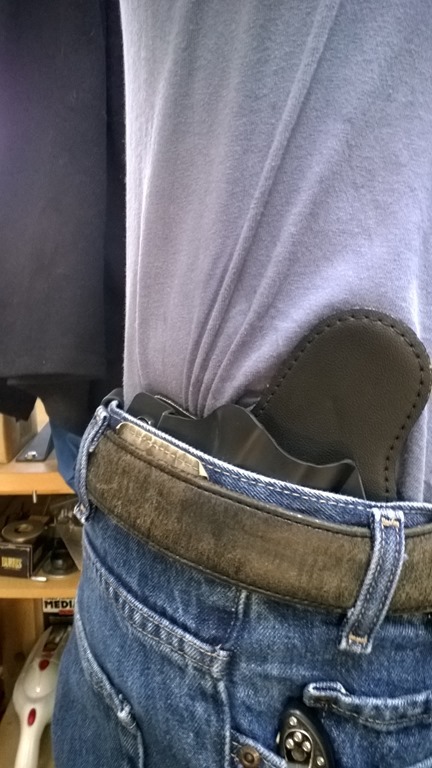 Insert the holster into your pants in the front just to the right of the zipper. Then, slide the holster around to where you will be wearing it. This didn’t work for me. The padding gripped the t-shirt I was wearing and slid it around with the holster. If I had not been wearing a shirt then it would have worked but why do this at all? Perhaps there is a good reason but I didn’t see it. I just rotated it into the position I wanted it and then slid it straight down sort of like I was tucking in a shirt. The holster is very comfortable to wear. 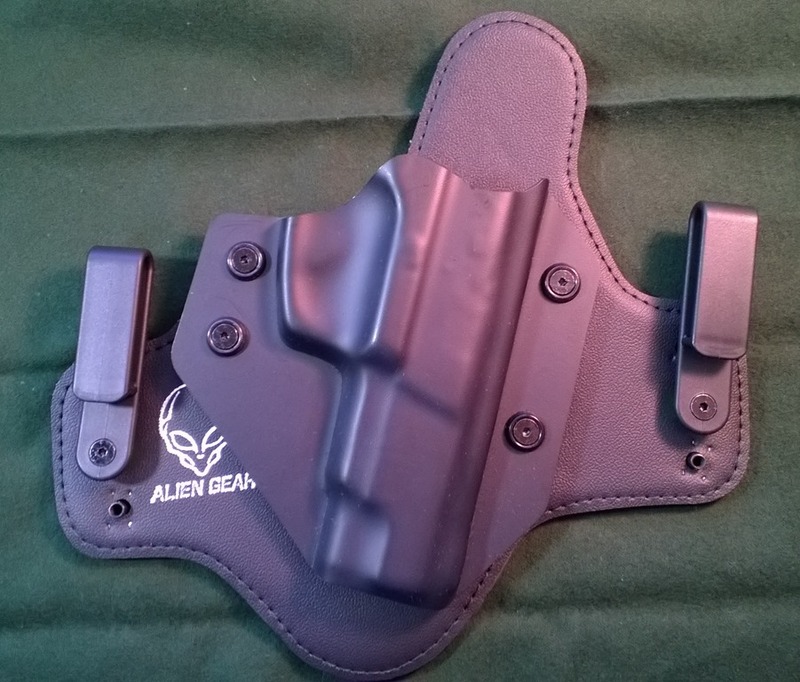 It has good retention for a holster without a locking mechanism. 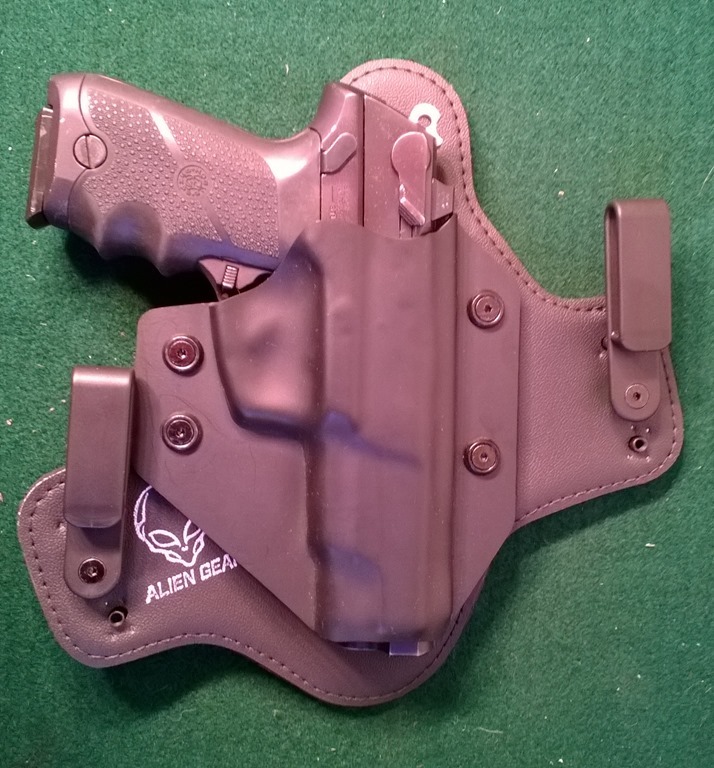 I could draw from it as rapidly as any other IWB holster I have worn and could reholster without a collapsed shell that needed to be opened up. 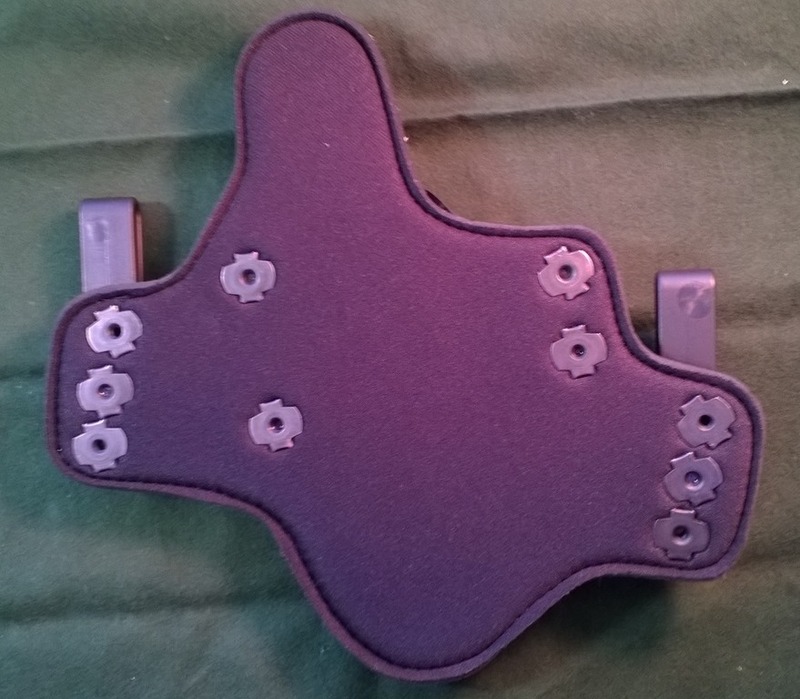 Although I found the defaults to be ideal for me the holster has a great deal of adjustment available. It has adjustable tilt angle, adjustable ride height, and adjustable retention. It is a very versatile holster. You can even use it with a tucked in t-shirt. Their warranty is awesome. With free shell trades for life if you change carry guns and forever protection against breakage. 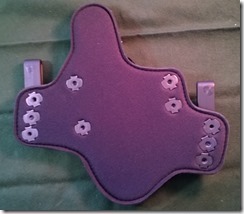 Give this holster very serious consideration. 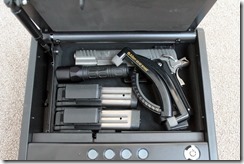 I was sent, for a limited review time, The GunBox Biometric Hand Gun Safe. They have a YouTube video on how to get into the box with a common tool. The video is not listed so that helps but security through obscurity is, putting it mildly, frowned upon in the security world. And if I didn’t have the gun in just the right spot it would fail to open unless I put some pressure on the lid when the mechanism was activated. 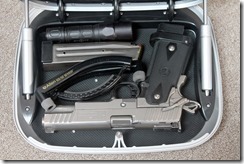 My Gun Blog .45 fit fine in most positions. Some positions were still an issue. The magazines had to be laying flat which took up more space than I thought they really should. 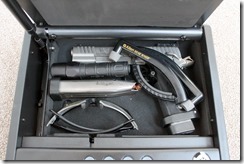 My Surefire 6PX Flashlight was limited to certain locations in the box as well. I would have like to have seen attempts at prying it open by someone with a little more skill and strength than the small children shown in the video. But it’s cast aluminum. A hacksaw is going to cut through it in seconds so anyone that has access to tools, time alone with it, and doesn’t care about damaging the box will easily gain access. This is not intended to be protection against skilled and determined thieves. It is opened via an RFID (wristband, optional ring, or RFID label to put on your phone or drivers license) or fingerprint. The slowest access time is with your fingerprint as it takes longer to read and process it than it does with one of the RFID access methods. From “the buzzer going off” to “first shot” took me about four seconds. With the wristband I could do it in three. I was a little annoyed with the wrist band in that I had to present a certain portion of the band to the sensor. For the easiest access to the box the buckle of the wristband needed to be on the top of my wrist which is the least attractive way to wear the band. Initially I wasn’t too keen about the opening mechanism but I was focusing on the wristband. I still don’t think I would wear the wristband all the time. And if you left the wristband in a drawer or in a closet then it would be more susceptible to discovery by the kids. Don’t worry about having the wristband around if you don’t plan on using it or if you lose it. You can have the box unlearn all fingerprints and RFID devices and reprogram it for just the opening methods you plan to use. And I might see putting the label on my drivers license even though it would be much slower to find my wallet in the pile of clothes beside the bed. It could read the label through the wallet just fine. It wasn’t necessary to remove the label from the wallet so the time to open would be primarily the time to get your wallet to the sensor. Some people might find wearing a ring acceptable. I’m not a ring person and I wouldn’t wear a ring just for this gun box. The fingerprint method seemed to work well enough. This is how I think I would use it. I programmed it to accept three of my fingers and one of Barb’s then she, her daughter, and I all tried all our other fingers in an attempt to get a false match. All attempts at false entry failed. I occasionally had failures to open on the first try with both my index fingers. I think it was the vertical angle (airplane pitch) I used when it was learning the fingers. When it was learning the fingerprints it was on the floor where I was taking pictures. When I was doing extensive access testing it was on the desk while I was sitting. I had it learn the same fingers again with the angle I used when sitting at the desk and access was almost 100% on the first try. They claim it will hold “approximately 100 unique fingers” so you might consider programming it for the same finger in different orientations for more reliable opening. You do not need to do this for various horizontal (airplane yaw) angles. The sensor works just fine for 360 degree access on the horizontal plane. That is very nice feature and it work flawlessly for me. I liked this safe and for keeping guns out of the hands of children and casual access attempts by unauthorized people I would recommend people give it serious consideration. It’s attractive enough to leave on the nightstand and functional enough to keep the kids out of it. 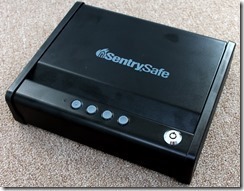 Authority Safes contacted me about reviewing one of the gun safes they sell. They wanted to give me a SentrySafe Quick Access Pistol Safe for review. Before I accepted it I told them that if I found something I didn’t like that I wouldn’t hold back in reporting that. They told me they wouldn’t want it any other way. That was a good start. I accepted the safe and played with it quite a bit. I didn’t follow through with this post as quickly as I should have. I have had the safe since sometime in early February. It has been sitting beside my bed making me feel guilty every time I step over it to get into bed. So today I finally got around to doing the last of the tests I wanted to do and now I’m reporting everything. First is the worst thing I have to say about the safe. As reported in this video review if you press the buttons too fast it won’t open. You have to try again. And “too fast” isn’t all that fast. I didn’t even have to try to have it fail. I have to deliberately slow down from what feels like a natural speed to me. But I may not be normal in this regard. Since I was in grade school people have commented on how quick I am with my fingers and hands. The second worst thing I have to say about the safe is about one of its features. That’s right, it’s not a bug, it’s a feature! After not opening the safe for several weeks I tried to open it and it failed even when I did it slow. What? I know that is the combination. Oh! Now I remember. The first button push is just to get its attention and doesn’t count toward the actual combination. It turns on the backlight for the buttons and gives you low level illumination for entering the combination. I understand why they did this. It’s kind of a cool feature but it delayed my entry into the safe by several seconds. If I had just woken up and was in a high stress situation my brain might not have solved the puzzle nearly as quickly as I did this time. I would recommend opening it at least once a week just to keep your fingers and brain up to speed on the proper combination and speed of button pushes. The third worst thing I have to say about it is that I am a little bit concerned about the back up lock. There have been reports of this type of lock being defeated with the barrel of a Bic pen. I tried some things but couldn’t find a plastic tube of the proper diameter. This concern is going to depend on who you are trying to keep the contents away from. If your threat model is small children then this safe is going to be great. If the threat model is a criminal with tools then the safe is probably susceptible, even if you utilize the supplied lag screws, to crow bar removal from your premises and a metal saw. If the threat model is a smart teenager with lots of time who wants surreptitious access then maybe you need to investigate further. Now the good things I have to say. It’s small enough it will slide under the bed and fit in a lot of drawers. 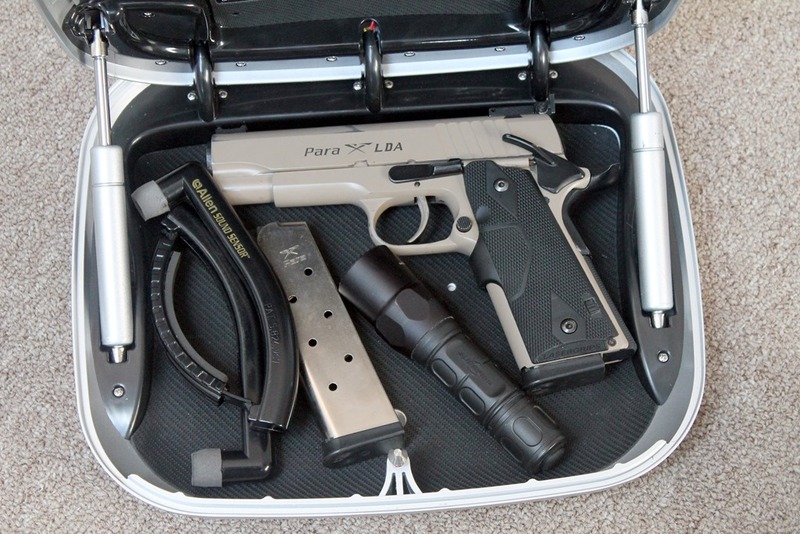 It’s large enough I can get everything I can reasonably expect to need, short of body armor, that I might need in a quick access pistol safe. The safe feels solid. I didn’t even have a temptation to try and pry or force things to gain access. I used to have a gun cabinet that just looking at it gave me the urge to apply a drill and a hacksaw blade to it. This safe did not tempt me in a similar manner. I trust this safe to keep my grandkids and casual criminals out of it while giving me ready access. It’s a nice looking safe. There are no easy pry points. The dark smudges are from me handling it with oily fingers. The surface cleans up easily and I would not expect corrosion even if I were to put it in a moderately abusive environment. 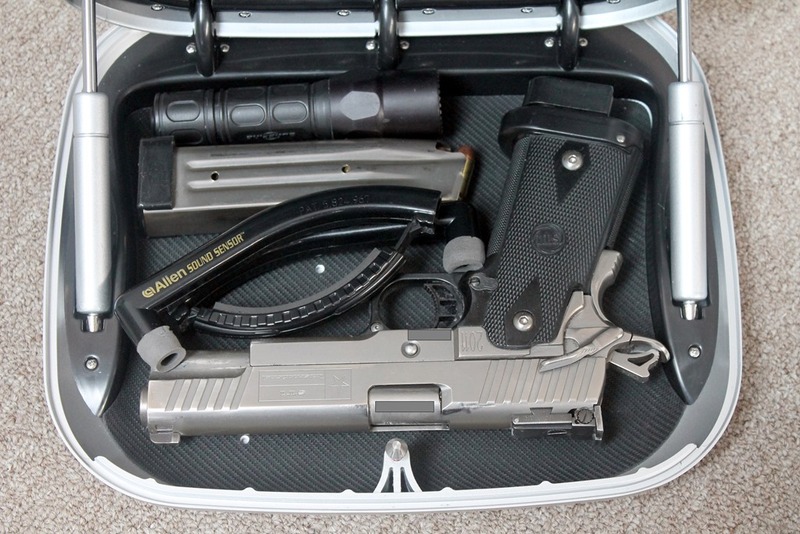 Above you see that I was able to put my loaded, cocked, and locked STI Eagle 5.1 with a 18 round magazine in the safe with room for two more 18 round magazines, in their holsters, a Surefire flashlight, and hearing protection. In another configuration I removed one magazine and substituted ESS eye protection. I didn’t realize it until after I took the pictures but I can also rearrange things and put the magazine in it’s holster in the position where the eye protection is and move the eye protection to the magazine position in the above picture. It all fits. I think it’s a good safe for most home applications and recommend people give it serious consideration. See also reviews by Say Uncle, Robb Allen, and their commenters. I didn’t watch the YouTube video linked to by one but I scanned it without seeing this particular safe. 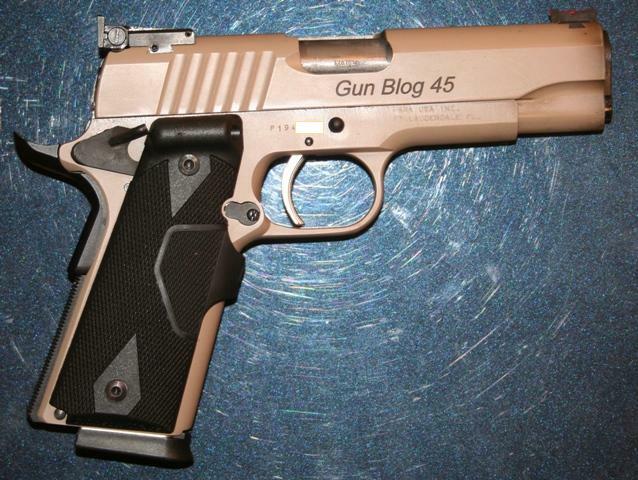 Custom guns just for us knuckle dragging gun bloggers! How cool is that? I had some problems yesterday and finally figured out what was going on (with a simpler repro of the problem by JR). If the gun cycles, you let up on the trigger to the first click, squeeze (it will hit a hard stop without firing), then let up until the next click, then pull the gun will lock up. You have to manually cycle the slide (roughly the equivalent to a computer reboot) to recover. I mentioned this to Kerby, the Para USA guy, and he said, “Yes. It will do that. Don’t do that. After the gun cycles move you finger until the nail touches the front of the trigger guard then do your pull.” He went on to explain that this is because I’ve been shooting single action guns for a long time. Others that shoot double action or Glock type actions before using a Light Double Action (which this is) don’t have this problem. At Microsoft we call a bug that is easily reached and causes the program to crash a Priority 0 bug. Priority 0 bugs must be fixed before the product is shipped. Telling the customer, “Don’t do that” isn’t really an option for a released product. Yesterday I had many failures to feed as well. After oiling the gun this morning those problems went away until very late in the day when the gun got dirty again. And after adapting my shooting technique to avoid the system lock up (and the required reboot) I did pretty well. On the last big “stage” at the end of the day with shooting on the move, shooting movers, and plates racks I had the best run of anyone (possibly even Todd who fumbled some reloads and had other problems) until Caleb shot the stage with a borrowed gun that had 18 round magazines. The rest of us used eight round magazines and I required five magazines to complete the stage. At the end of the day several of us, including me, were able to hit the eight (?) inch plates at 35 yards half the time or better. I have to conclude the gun works well as long as you don’t run into that one bug. Draw your own conclusions as to whether the gun (your version would look like this) is for you.